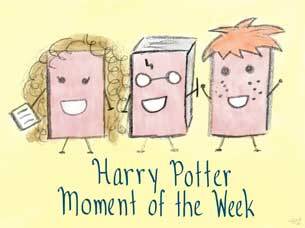 Harry Potter Moment of the Week is a meme hosted by Uncorked Thoughts and Lunar Rainbows. The aim of this meme is to share with fellow bloggers a character, spell, chapter, object or quote from the books/films/J. K. Rowling herself or anything Potter related! A list of upcoming topics can be found here. If You Could Open a Shop on Diagon Alley, What Would It Be and Why? I love the unique feel of a craft shop. I bet Diagon alley could totally use one. Matt @ JC's Book Haven. I know I would spend a ton of money in there if such a shop existed, lol. I like the idea of your store. I've gotten really into crafty stuff lately too! I really enjoy knitting and scrapbooking especially, and I wish I had more time for them! I think I would be my own best customer, because I would want to buy everything I sold, lol!